It was the summer between by sophomore and junior year when my boyfriend (now husband) and I backpacked through Europe for the first time. While planning the trip, we focused on the “main” historical sites like London, Paris, Florence and Rome. These cities have been so influential throughout history so we knew from the beginning we wanted to go there. We wanted to make sure no matter what happened in our lives, we got to travel to these giant and well-known cities at least once. On this trip, we also went to visit a friend in Ennis, Ireland that I met through a Student Ambassador program with Phoenix Sister Cities. We ended our trip in Dublin. 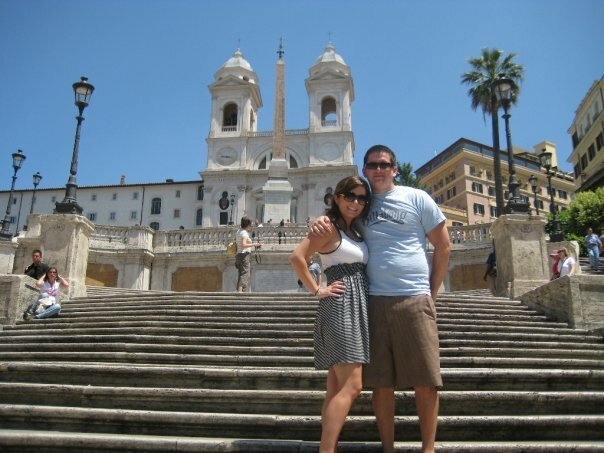 Liz (Me) and Alex (now-husband) at the famous Spanish Steps in Rome. The steps were empty that day because it was in the middle of a giant heat wave in Italy. I got so dehydrated that day, I paid 6 Euro for a bottle of water by the Coliseum! Liz (Me) and Alex (now-husband) at the famous Temple Bar in Dublin. 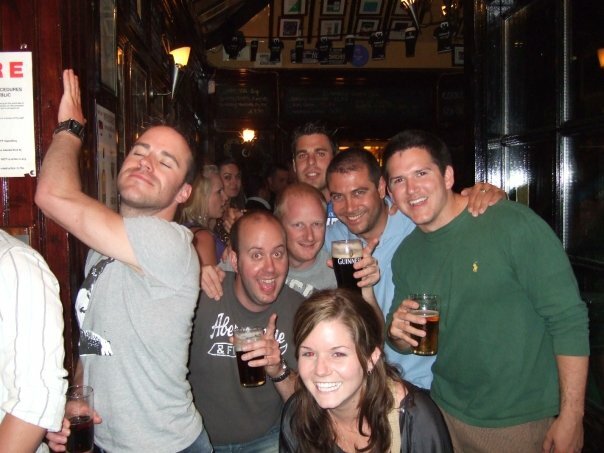 We met these guys at a Pub Crawl tour hosted by a couple of hostels in the area.They are all from Switzerland and we still talk to them today via Facebook. We didn’t hold back on the Guinness while there…This picture is a great example of how not all contact zones, or when two cultures meet, create conflict. We are lifelong friends with these people! Hostels allow you to get a more accurate glimpse of the city of the city you are visiting. In Rome, the guy in charge of checking in people at our hostel decided one night to cook all the backpackers a home cooked Italian meal. He invited his friends over and we all ate together and got a taste of what it would be like to be a local. If you were staying in a hotel, I doubt this situation would be likely to happen! It is those type of crazy, fun experiences that give you a glimpse into the true culture and lifestyle of those cities. For our second time backpacking throughout Europe, we mapped our travels by deciding to be sporadic and letting the cheapest ways to get somewhere decide where we go. The only thing we knew we wanted to do when we first began mapping our trip was having our final stop be Prague so we can stay and visit another friend I met through my student ambassador program. We booked the cheapest flight we could find; we flew into London and out of Prague. We then began the sporadic process of mapping our trip out. We decided to use the budget European airlines, Ryan Air and Wizz Air, to go everywhere. Our first trip taught us that flying can be one of the cheapest ways to travel around Europe. Trains can actually be the most expensive sometimes! We pulled up the websites to these two airlines and began mapping out and deciding where we would go. We looked to see what were the cheapest places to fly to from London two days after we arrived; it turned out to be Seville, Spain. We decided we would spend a couple days there and then looked where the cheapest place from Seville was; it turned out to be Ibiza, Spain. From Ibiza we decided to go up to Brussels, Belgium then down to Budapest, Hungary and pass through Vienna, Austria before ending up in Prague. I highly recommend traveling and mapping your trips this way. You get to see cities you might never have traveled to otherwise. Take a chance and don’t make up your mind before mapping your trip out where you are going to go because you want to, try it our way and just map out your trip by wherever is the cheapest to travel to. Plus, the trip was a lot cheaper that way! We got one flight for 15 Euro each!! We had ZERO interest of every going to Brussels before this trip, but we ended up going there because it was one of the cheapest places to go to the way we planned out our trip this time. 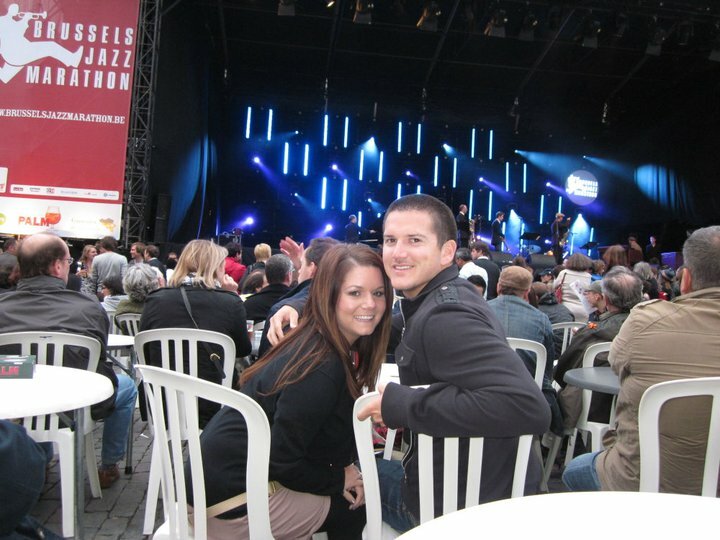 We ended up being there during a giant jazz festival. It was amazing. We would wonder around the city and stumble upon another giant concert venue. Here we are in the main Market Square. If we didn’t sporadically map out our trip like we did, we would have never gone to Brussels, and therefore never gotten to see dozens of world-famous musicians on a whim. Trust me, take a chance on traveling the way we did this trip! You won’t regret it! 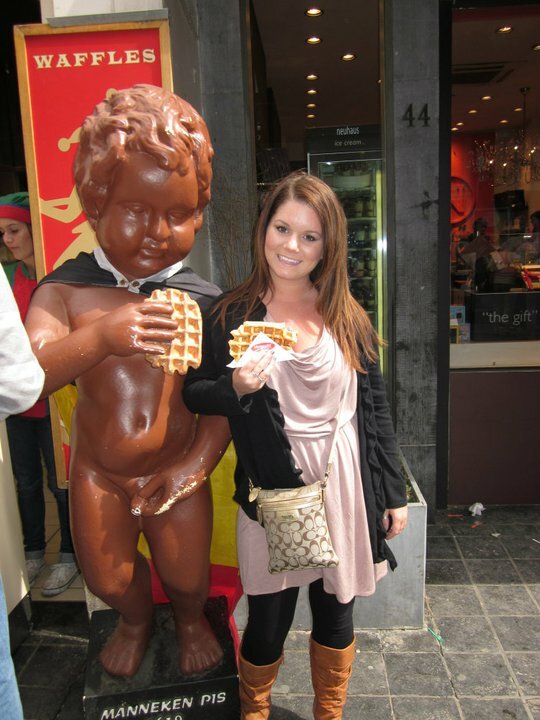 Plus, I now know Brussels has the most amazing waffles in the world after taking a chance and mapping my trip this way! 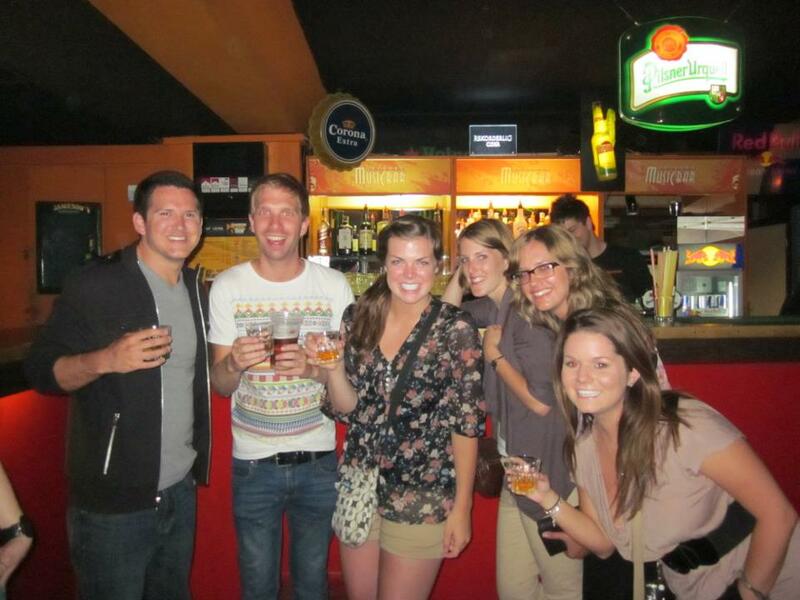 We met these Australians through our hostel in Prague. Here we are at Lucerne club in Prague. This club is famous for only playing 90s pop bands like NSYNC and Britney Spears. We had a great time reliving our childhood. We still talk to them today! Traveling writing is a map. Seager’s “Maps,” explains how maps have helped shape history; there is no telling that 100 years from now people won’t look back on what we wrote about it will affect history. Travel writing is definitely creating a map for your readers. Not only does it map your geographical travels, it also shows us your personal map. It was great that you were able to go places that you thought held no interest to you. Your descriptions of the hostels and being able to overlook the landscape while reflecting on the self reminded me of Blanton’s text, “Narrating Self and Other.” He states, “The reverberations between observer and observed, between self and world, allow the writer to celebrate the local while contemplating the universal” (Blanton 5). I believe sometimes when we are surrounded with unfamiliarity, it is easier to reflect on ourselves. Do you prefer observing or being a part of the action when you are in new cultural settings? Your story of hostels sounds awful. Honestly, I had to look them up to understand the difference from a normal hotel (last week when I first came across the word). I had thought it was a spelling mistake. Do you usually prefer hostels for the experience and lack of expense when traveling? I applaud you for backpacking as a way of travel. I looked into it at one point in time, but must admit that I do not think I could travel so sporadically. I would highly suggest that you create a sort of “So you want to backpack across…” type of post. Your audience of potential travelers would definitely benefit from some first hand knowledge of how to even start planning a trip. I looked through http://thesavvybackpacker.com/ trying to get ideas of what backpacking would be like. Are these some of the same strategies you use when traveling? We are really getting a chance to know you through the mapping of your blog. Your voice and style are really coming through. It seems that you have had some great travel experiences. I am looking forward to continually seeing what adventures you share. That is an excellent idea to have a “So you want to backpack across…” post! I think I will definitely do that. The Savvy Backpacker is a great blog and I completely agree with 99% of their advice! I have looked to that numerous times in the past. While traveling, I think it is definitely a mix of observing and being part of the action that makes me enjoy it so much. I love taking it all in. Some of my most favorite afternoons abroad were when I would relax at a pub or cafe’ after a long day of sightseeing and just people watch. I loved listening and seeing the locals live their daily life. I also LOVE being part of the action. That is probably the greatest benefit to the hostels; you get a cheap place to stay in the heart of the city. You are usually walking distance to everything you would want to see or do. The city is yours to take and experience! I love hostels, but I love the comfort of nice hotels and having your own private room. I went to Europe recently for my Honeymoon and we took a cruise. It was nice being able to get back on the ship and have some privacy and your own bathroom. Liz, I really enjoyed your backpacking posts!! Recently, my daughter traveled to England to stay with a friend who had been studying abroad. They decided to make their way to France and stayed at a hostel while there. The two of them had a delightful time getting to know other people in a way that a hotel cannot provide. Thank you for sharing your experiences. I am so glad to hear that you embraced your daughters travels! I truly think traveling and experiencing the world make you grow up and have a bigger compassion for everyone from all walks of life. Hi Liz, I enjoyed reading about your two backpacking adventures in Europe! Your first trip reminded me of my own experience in Europe; because I went with a student group, we went to all the big spots in Europe like Rome and Paris as well. My favorite part of the trip was an evening spent wandering the streets of Rome – the Spanish Steps were our designated meeting place at end of the night. Because we were high school students, we either stayed in regular hotels or with host families. The host family experiences – I imagine like your experiences in hostels – were a great way to learn more about every day life in other countries. If I ever have the chance to return to Europe, I’ll definitely be considering the advice you gleaned from your second trip. 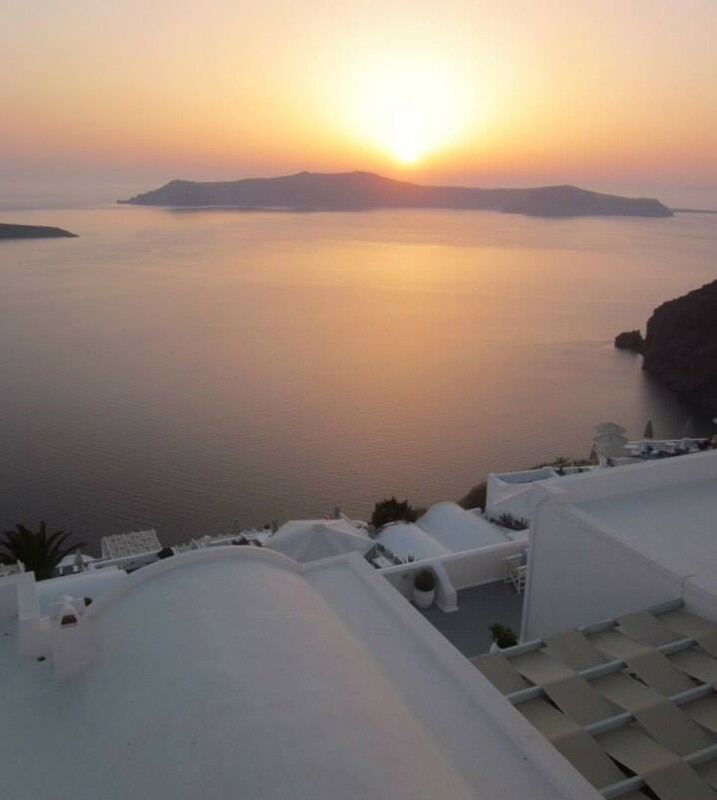 Picking destinations based on the cheapest travel sounds like a great way to go new places without breaking the bank. And I would like to get off the regular path a little more next time – destinations like Seville and Brussels sound perfect! Avoiding common tourist cities can be a great way to save money while traveling. I loved going to the places that aren’t always on the top of everyone’s “must-see” Europe destinations. It was a great experience. However you decide to travel to Europe next time, I hope you give the random places a try! What a great conceit for a blog – what’s the cheapest to fly to from here? I wonder if that could get you around the world somehow? To have that kind of spine to your travel plans is very interesting because, like your example of Brussels, it opens you up to new experiences, AND you seem to be surveilling your surroundings with an accepting eye. The heart of a true traveller is the person that accepts experience without making irrelevant and out-of-context judgments. And you have wonderful pictures, particularly for your background, which I need to learn how to do! Waffles in Brussels… yum! When I was there I had two of the huge ones with chocolate and whipped cream. I felt so sick afterwards, but just kept thinking that was totally worth it 🙂 Did you have the chance to try “french fries” from a street vendor and get lectured on their real origin in Belgium? I’m glad you included the photos, it’s nice to be able to see the trips throughout the text. Do you already have your next vacation planned or are you waiting to see what pops up as the cheapest? !